Festival Report: Warming up for the Ratha Yatra ! ~ The Toronto Hare Krishna Temple! Festival Report: Warming up for the Ratha Yatra ! Counting Down to Ratha-Yatra with Mantras, Fire and Offerings! As the city is springing into action with warmer weather arriving, the Toronto Hare Krishna Community also sprung into action by having its annual "Ratha-Yatra Launch Day" on Sunday, May 1, 2016. The Launch Day is an annual celebration that is held every spring to help "launch" the countdown to our biggest festival of the year: Ratha-Yatra (Festival of India)! The evening started out with arati ceremony for their Lordships Sri Sri Radha Ksira-Chora Gopinatha, who were stunning in their gorgeous light blue spring outfits. 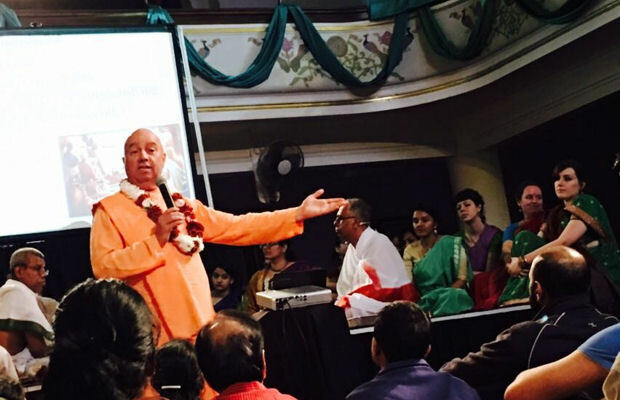 Then Bhaktimarga Swami gave an informative talk about the historical importance of performing fire sacrifices. He explained that this sacrifice (yajna), was being performed to launch off the Ratha-Yatra in the right mood. After bringing all the devotees into a divine mood, the priests began the fire sacrifice. They incorporated an interactive power point presentation which they used to explain the importance of the mantras being recited. They started out by purifying the temple, reciting mantras for auspiciousness, then scarified various grain items, clarified butter (ghee) and wood into the fire. Soon, the temple was radiating with warmth, divinity and all auspiciousness. All the assembled festival-goers experienced the divine and mystical powers of Lord Jagnnatha (Lord Krishna). This blissful evening, closed with an energetic kirtan and arati ceremony. Devotees left with hearts and tummies filled with devotion and a vegetarian feast. Yes, ti was indeed a very special evening! Hare Krsna!